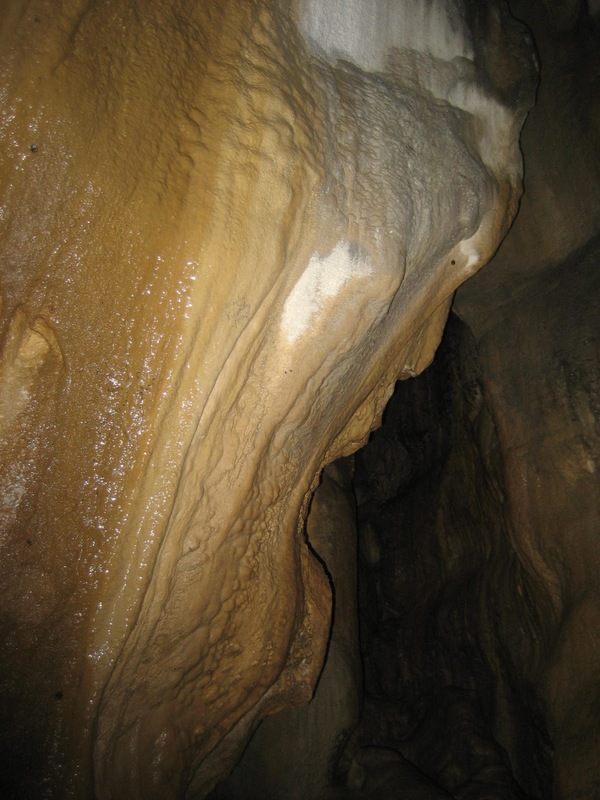 When, instead of dripping from the cave ceiling, water runs down the walls of a cave passage, flowstones or dripstones are the result – and these are the most common of all cave formations. 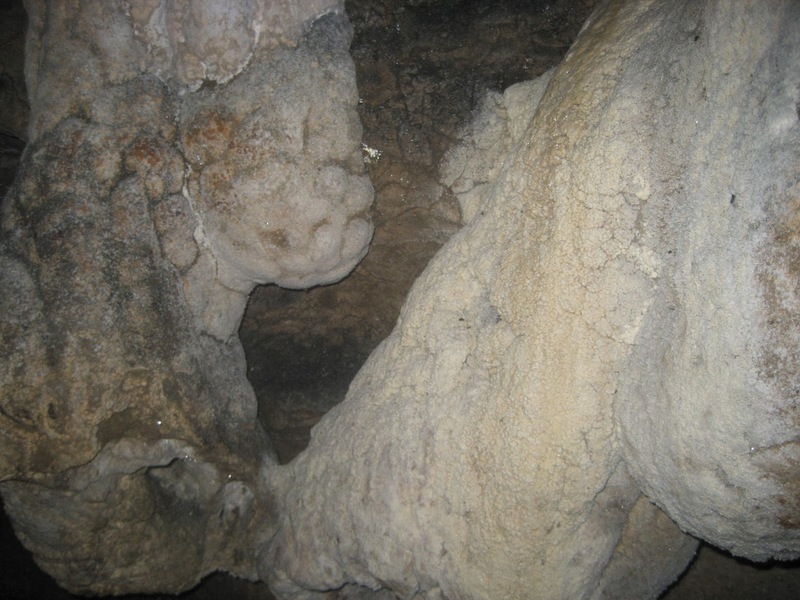 Water rich in calcium carbonate, aragonite and other minerals is agitated by the steep flow down the cave wall, and this causes loss of carbon dioxide to the cave air – allowing calcite deposits to be slowly built up on each other. 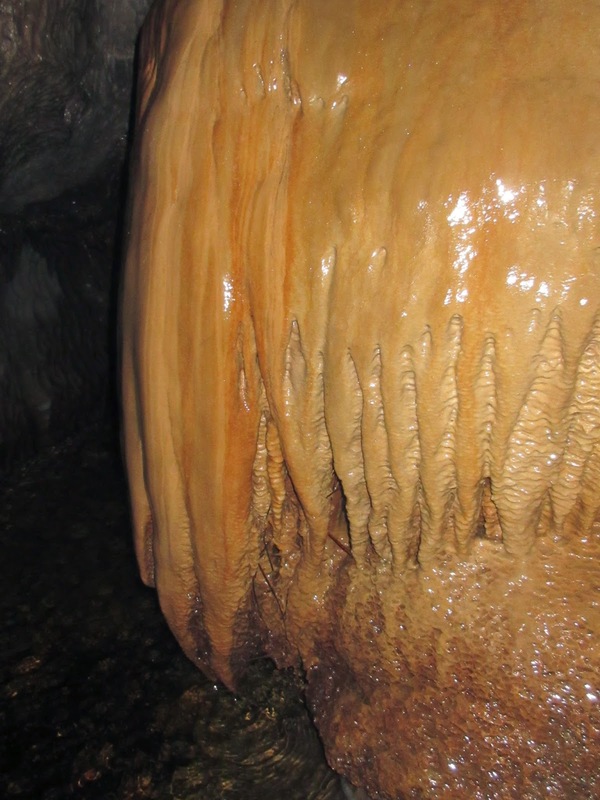 This flowstone often takes the form of curtains or drapes, such as in Great Douk Cave, which contains some of the finest easily accessible flowstone on Ingleborough. 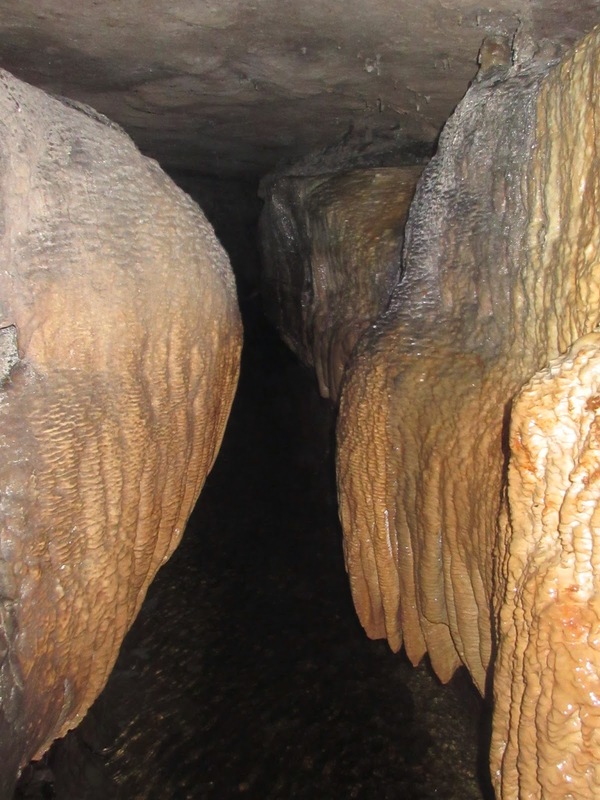 Often, fingers of flowstone appear like organ pipes and one example in Ingleborough Cave has famously been used to produce a range of pitched sounds! 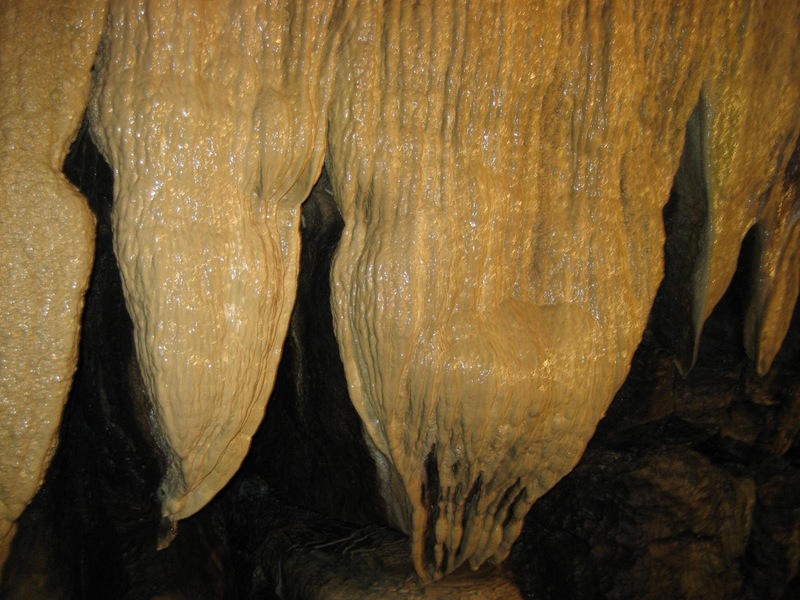 Like stalactites, however, flowstone is very delicate and even touching it can damage its beauty. Oily films from human fingers can prevent water flowing over an area, drying out the feature and causing ugly patches. The problem is that flowstone is often bizarrely beautiful, and the temptation to touch it – for a novice at least – very great. Also, passages are often narrow – so every squeezing caver contributes towards the damage. Show Caves such as Ingleborough and White Scar are helping preserve some of the finest examples for future generations. Gours (or rimstones) form where mineral rich water overflows from small, often suspended pools and deposits calcite to build up an attractive series of natural dams – often taking pillow-like shapes. 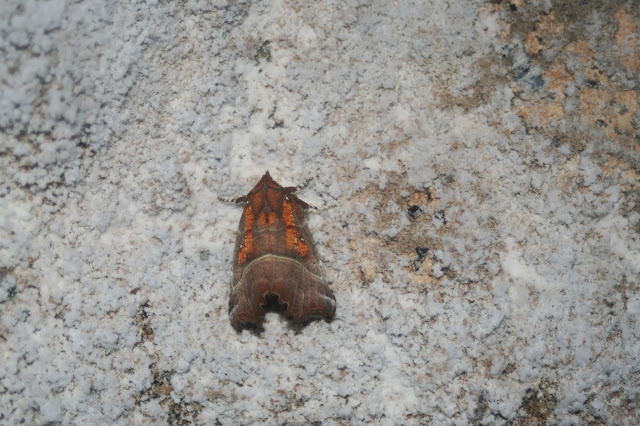 Many of the most beautiful gours are well hidden in the depths of the less accessible caves, but good examples can be seen in Gatekirk Cave and Bruntscar Cave, both in the northern section of Chapel-le-Dale between Whernside and Ingleborough. ‘Moonmilk’, often seen decorating the ceilings of Yorkshire caves, is, by contrast, a soft, creamy-white substance. It is another precipitate from limestone, made up of calcite, aragonite and hydromagnesite – but its origin remains a mystery to speleologists. Many believe that bacterial action is the main contributing influence on its formation – though there are several theories being debated. 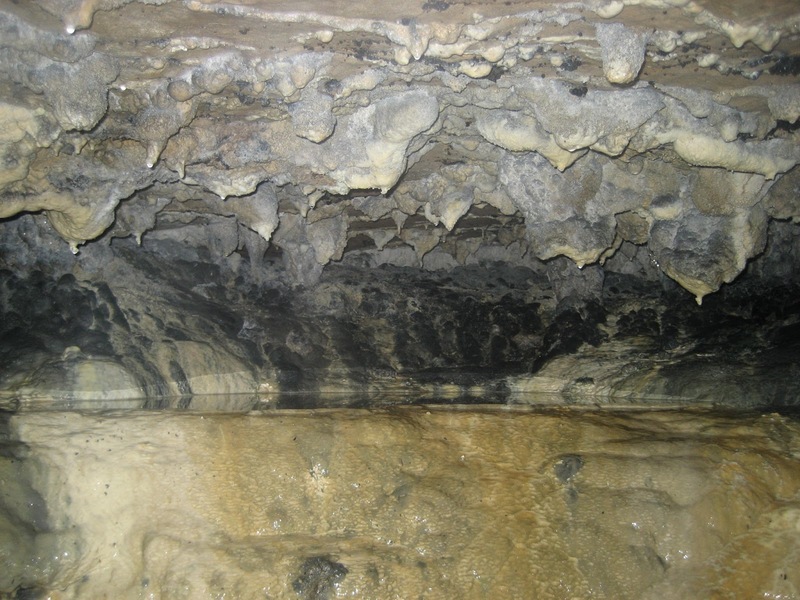 The Kelcow Caves on Giggleswick Scar contain lovely moonmilk decorations, and Thistle Cave at Ribblehead has an attractive moonmilk ceiling for much of its length.